An opulent feast for the eyes, Rudolf Stingel's Untitled is a golden vision of texture and pattern on a monumental scale that speaks to the artist's enquiries into the possibilities of painting. Executed in 2006, Untitled builds on Stingel's silver monochrome paintings from the late 1980s created through his own unique strategy of semi-automatic methods, utilizing enamel and tulle fabric. Here in Untitled, Stingel uses a stencil to produce the feeling of a baroque-inspired fabric rendered by paint alone, conflating the visual richness of decorative painting with a Minimalist commitment to serialization and mechanized modes of creation. However, in a nod to the hand of the artist, Stingel intentionally inflects the surface with small deviations and highlights. Deeply interested in the seductive, tactile quality of painting, Stingel's applicative process imbues the surface with deceptive complexity, with his pattern taking on a raised, woven quality which not only alludes to the method of its creation but also contrasts with the arabesque pattern. By conflating the qualities of the painting with that of architecture and even sculpture, Stingel's practice is an investigation into Modernist precepts surrounding the definitions of artistic mediums. The particular decorative vocabulary present in Untitled relates to Stingel's roots, as he grew up in the Italian Tyrol and Vienna and was exposed at an early age to their histories of Baroque and Rococo art. The Baroque was a historical, aesthetic and stylistic pursuit that conflated artistic disciplines, bringing together painting, sculpture and architecture for dramatic and theatrical ends. In Stingel's practice, and especially in Untitled laden with the historical antecedents engendered in the pattern itself, the parameters of painting and architecture are amalgamated. Here, Stingel not only repositions painting by subverting the traditional qualities of the medium, namely that of pictorialism, flatness and illusionism, but also redefines it within and as an integral part of the interior architectural space. This dislocation of painting and architecture reintroduces pictorial space in a different form, in which architecture is flattened and painting takes on a three-dimensional aspect. Indeed this investigation of the nature of space and handling it with or without the conventional space of painting has become Stingel's signature mark and obsession. What Stingel manages to illuminate with works such as Untitled is the possibilities that abound from the conflation of painting and architectural and the potentials this offers to expand our notions of defined modes of representation and media. Taking Robert Ryman's painterly investigations of the 1960s a step further, Stingel has spent the past thirty years investigating the boundaries of the medium through surface and materiality. His installations have progressed from silver celotex walls where viewers are invited to make their own mark on the surface to expanses of shag carpets that merge the surface and materiality of paint into one fused object. The thread which links all of his interrogations is that of the surface, and the potential for its tactility to engage us to leave a mark in the everyday. As one example of his exploration of this methodology from his monochrome series, the materials from Untitled both capture the presence of his gesture as well as the gesture itself, allowing the surface of his canvas to become an impressionable space. 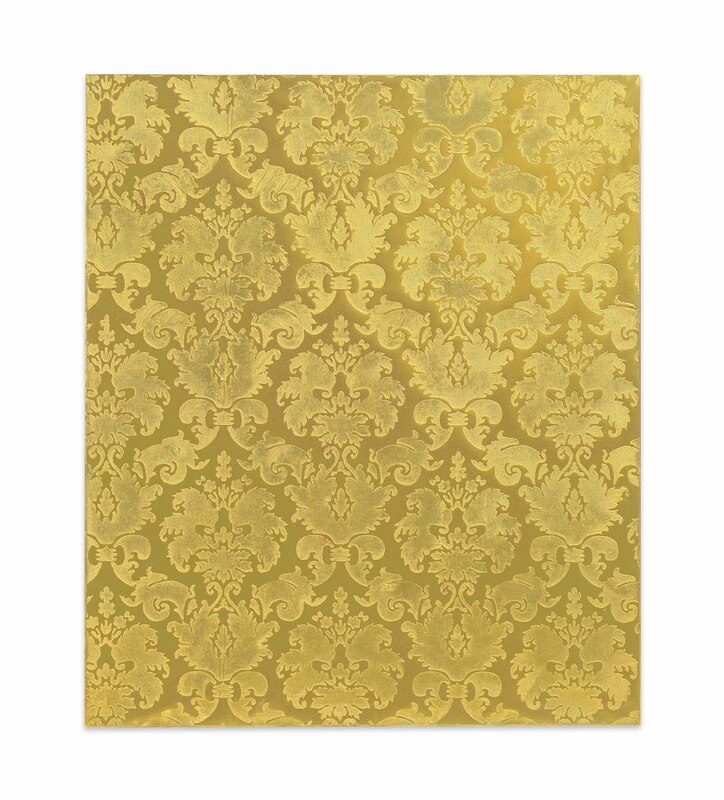 Throughout his career Rudolf Stingel has put pressure on the modernist resistance to decoration, presenting the stylized floral design of a Baroque-inspired wallpaper as a freestanding abstract painting. While the familiar pattern might at first appear to be a merely banal fragment of a wall covering, upon closer inspection the painting reveals itself to be spatially ambiguous, as the variations of golden paint tones push and pull against each other to create a scintillating effect. In this way, Stingel's work alludes to the complex spatial interplay of Baroque art, but with a distinctly contemporary twist.